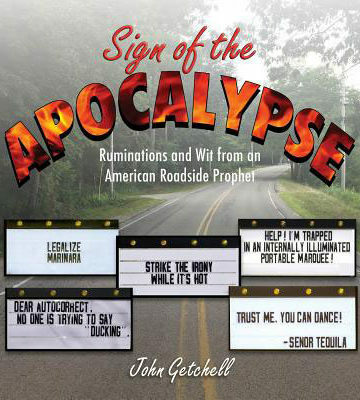 Sign of the Apocalypse – The Book: Friends, neighbors, and passersby from all over the country can’t fail to miss “The Sign’s” constantly changing humor and insight. On occasion, The Sign of the Apocalypse (SOTA) traffics in the earnest, but at its heart is rooted in a deep-seated desire to express the sarcastic and snort-worthy. This, and a love of haiku, pizza, Latin, double entendre, and the worst puns ever crafted. Two years in the making, the message on “The Sign” is changed on a daily basis, with the primary benefit of slowing passing traffic to a honking crawl. It was designed to convey pithy tidbits of thought and wordplay. In its conception, SOTA was perpetrated in spite of the objection of the author’s girlfriend, and with hopes of creating controversy and dismay in the local community. The girlfriend packed up and left, and the community and town fathers were surprisingly gruntled by the proceedings. •	What if doing the hokey pokey really is what it’s all about?